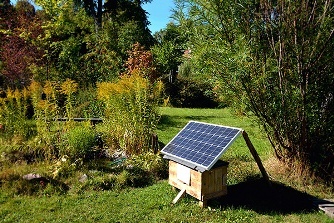 Solar panel for gardens seems to be an innovative idea. There is a large open space in gardens and that could be effectively used. Then power pumps, fountains and ornamental lights can be runned by solar electricity. Solar powered path and garden lights are nowadays becoming common in most garden centers. As well as the fauna and flora, two other important elements that make up a garden landscape is water and lighting. A garden pond or water feature adds sound and interest to a garden while at the same time helping many of the birds, bees and other such insects that the presence of water in a garden brings creating a healthier and more beautiful environment all year around. We are the leading manufacturer, supplier, exporter and installer of solar panels for gardens. Lighting adds interest and safety to a garden at night and that too solar lights would be a great idea! !